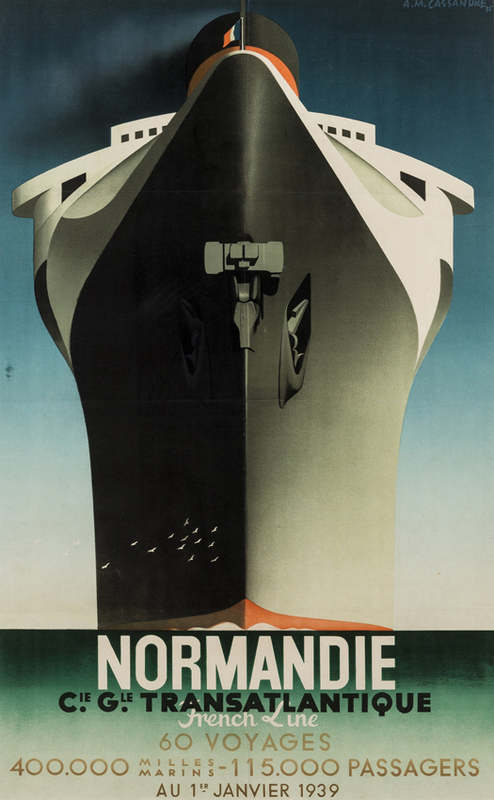 A rare lithographic poster for SS Normandie to be offered at Forum. 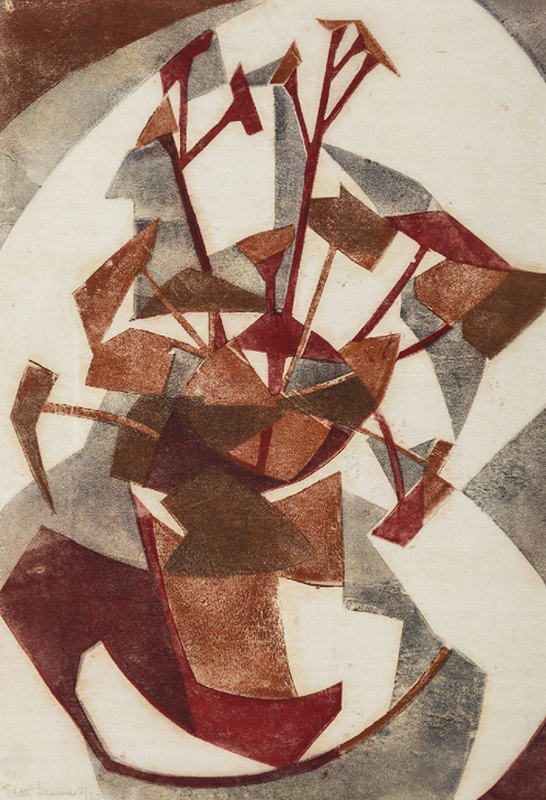 Here is a selection of highlights from across its Editions and Works on Paper sale on January 29 and its Private Press, Illustrated Books and Modern First Editions auction on January 30. A 1962 pencil on paper 'Girl pushing three children in a pram' signed and dated by Laurence Stephen Lowry (1887-1976) will be offered at Forum Auctions. 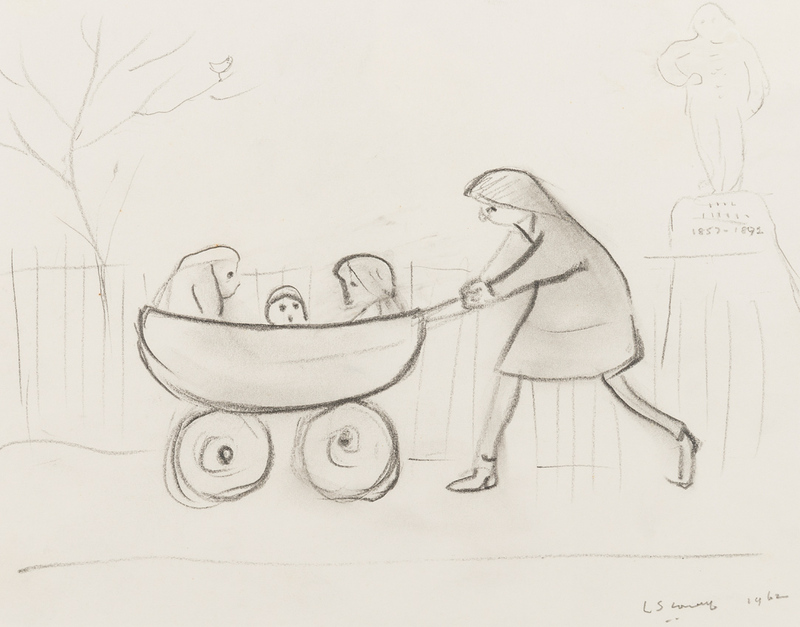 A 1962 pencil on paper Girl pushing three children in a pram signed and dated by Laurence Stephen Lowry (1887-1976) will be offered at Forum Auctions’ Editions and Works on Paper 1500-2018 sale on January 29. From a private collection, with provenance to dealers Richard Green Gallery and Trinity House Paintings, the 7.5 x 9.75in (19 x 25cm) work is estimated at £10,000-15,000. View the lot on thesaleroom.com. Four Gospels of the Lord Jesus Christ. Close to 300 lots of private press books feature in the sale and among them is this copy of the celebrated 1931 Golden Cockerel Press Four Gospels of the Lord Jesus Christ. 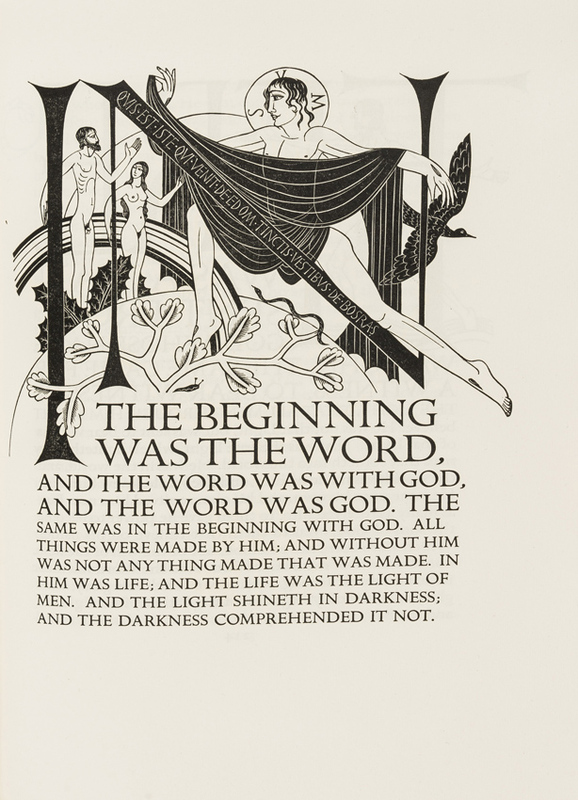 It includes wood-engraved illustrations and initials by Eric Gill. Numbered 296 of 500, this copy was owned by art collector and Arts & Crafts movement patron Laurence W Hodson (1864-1933). It is inscribed by him to his daughter-in-law Lilian: Given to Lilian. Christmas 1931. It is estimated at £5000-7000. View the lot on thesaleroom.com. This 1938 rare lithographic poster - a classic Art Deco image from the golden age of travel by French designer Adolphe Cassandre (1901-68) - is estimated at £9000-12,000 at the January 29 sale. Printed on wove paper and titled Normandie, 60 Voyages, it was published to promote the maiden voyage of the legendary ocean liner SS Normandie. View the lot on thesaleroom.com. 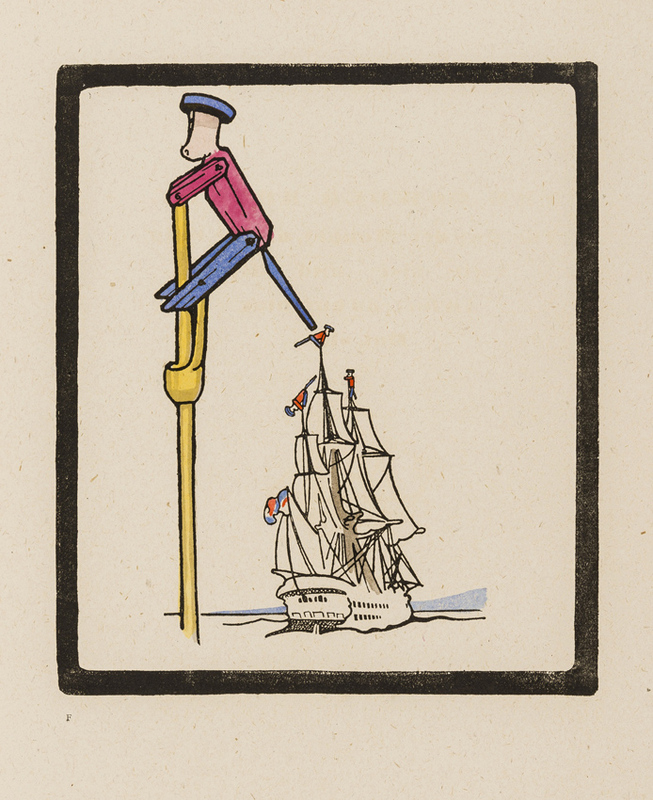 A copy of Edward Gordon Craig’s first book, 'Book of Penny Toys', will be offered at Forum. With woodcut and partly hand-coloured illustrations, Book of Penny Toys is the rare first book of writer, theatre director and designer Edward Gordon Craig (1872-1966). This is number 136 of what had originally been planned as a print run of 550. However, the number of copies available for sale in 1899 was drastically reduced when Craig burnt half the edition after deciding that hand-colouring all of them would be too laborious. It is estimated at £2000-3000 on January 30. View the lot on thesaleroom.com. This c.1930 linocut ‘Plant in a Pot’, was produced in an edition of 50 by Edith Lawrence (1890-1973). This Grosvenor School print, Plant in a Pot, was produced in an edition of 50 by Edith Lawrence (1890-1973). The c.1930 linocut, 13 x 9in (33 x 23cm) in size on buff oriental tissue paper, is estimated at £2000-3000 on January 29 at Forum. View the lot on thesaleroom.com.